Some market data is current and measured. Some looks to the future and is forecast. While very different from each other, each has its own value and reliability. For example, Evans Data’s recently released Global Developer Population and Demographics Report , shows a total worldwide population of approximately 23 million developers. This is forecast to grow to 27.7 million by 2023 which is based on a growth rate that varies slightly by year but turns in an average of 3.86%. Growth projections are based on a very long and solid regression analysis going back to 2006 and, barring a huge economic event of some kind, they are quite reliable. In the same study we find that 7.3 million developers are using Clouds for their development environment (either public, private or hybrid), meaning they write their code, debug, build etc in the Cloud itself. Cloud vendors of course encourage this and often supply tools and incentives for developers to work in their Cloud environments. These efforts have been very successful and we find that an additional 4.9 million developers report that they EXPECT to be developing applications in the Cloud within the next 6 months. That’s a highly significant growth rate and if that were achieved and repeated every six months for 1.5 years the Cloud would be the ONLY environment that developers would use in just two years. But there’s a big caveat. Developers are wonderful beings, but they’re not prescient. And for this question they are using their intuition rather than any type of data analysis. They have been predicting a similar adoption rate for Cloud development for several years; and though the Cloud as a development platform has definitely grown, it hasn’t grown to that extent in any six month period. That’s why we think of the future intentions that developers tell us as just that – intentions. But make no mistake, intentions are important. They not only tell you what the person thinks he’s going to be doing, but in most instances they imply what he wants to be doing or what technology he thinks will be successful. This glimpse into the psyche is essential for product strategy, as well as marketing, messaging and positioning. Current attitudes and perceptions highly influence actual future adoption and can they can be an invaluable resource to inform a product strategy for great results. How Fast do Developers Move Along? There’s a tendency in our industry to assume that software developers immediately migrate to the newest version of any tool or technology as soon as it’s announced, and there’s a bit of truth in that. Certainly many developers are passionate about technology and adopt “bleeding edge” innovations even as they’re in beta before production release. But while developers do tend to become excited about technology evolutions and love to try them, there are actually a lot more considerations to be taken into account when abandoning a tool, platform or technology than when adopting a new one. Embracing the newest tech is initially easy because there’s no background or canvas to be worked into the project unless and until the project has to integrate with existing technology. But giving up older versions can cause a realm of trouble because newer versions may not support the same functions as previous versions or may not be compatible with software created with and/or around the older technologies. In our newly released Global Development Survey 2018 -2 report we found that while just over 53% of developers will continue to use a tool or other technology no longer than 6 months after it has been discontinued, another 29% will continue to use it for up to 2 years after discontinuation, 8% will use it up to 5 years, and 10% will use the discontinued tool or technology indefinitely – basically never abandoning the old technology. 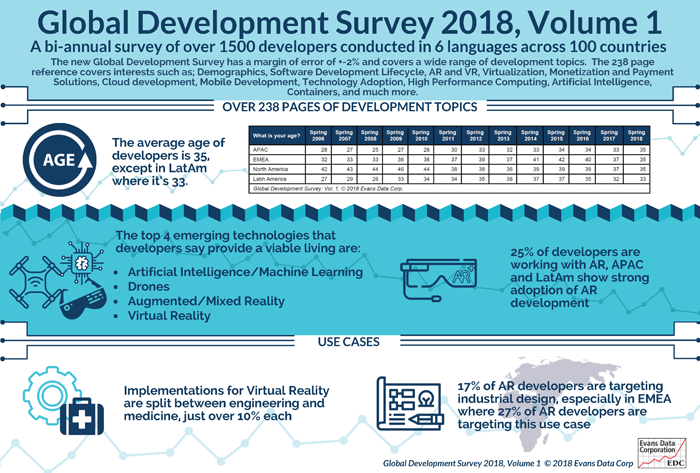 This survey was conducted last month in 6 different languages worldwide so we can see some regional variations in the length of time a developer will keep using an obsolete technology. Latin American developers, in particular tend to want only the latest and greatest, and this may be because this emerging region doesn’t have the historical legacy baggage that slows down other regions. On the other hand, the EMEA region is most likely to be where developers will never give up their old tools or technologies. APAC region also has lots of early adopters, and North America is middle of the pack. So, just because a vendor discontinues a product, don’t think usage will dry up overnight – it could take a long time to move all developers to a new version. Imagine going into a store, tacking your steps on a visual display map on your phone and seeing bright red stars over everything you’ve bought in the store over two weeks ago and thus might need again. Or strolling through Paris and pointing your phone at a building and getting a visual history of it from the 17th century to the present, then turning around and pointing at an insect on a flower and getting the names of both and maybe some animation depicting how they pollinate. These are commonly dreamed up implementations of augmented reality (AR) for consumers. They’re fun, interesting and easy to understand, but they’re probably not the first area where AR is going to flourish and come into its own. According to our recent Evans Data Global Development survey, software developers who are actively creating AR applications today are most commonly targeting industrial design for their apps. Almost a quarter of the world’s software developers claim to be kicking the AR tires, trying out AR in projects, experimenting, or actually working on functional apps. Of those, 17%, the largest group, are targeting industrial design. The survey, conducted in over 100 countries and in six different languages, showed that augmented reality functionality within apps is being adopted particularly strongly in emerging market regions in APAC and Latin America, but it was the EMEA region where the strength of industrial design was most clear. But what does that mean? Industrial design today is done with CAD programs, drawings, applied mathematics, electrical and mechanical engineering tools, models, and so on. For each widget there is a lot of time and resources required as well as diverse steps and tools. But imagine AR applied to industrial design. This would mean a product design environment where your design exists as a 3D object, projected virtually in the space before you – sort of like a hologram. This 3D image is constantly fed information from the physical world as well as the virtual one, so your virtual product behaves just as it would if it actually existed. It would simplify and speed product design as we’ve never known it. New and better products would be able to come to market in a fraction of the time. Now, it should be pointed out that the number of developers targeting industrial design is a very small plurality. Commerce and engineering are next, followed by numerous other use cases that get single digit responses. So this new emerging market is still fractured and forming, but it’s exciting to think about all the ways AR will be able to change our lives in a million different ways – through healthcare advances, retail, travel, entertainment, you name it! Are Hackathons Losing their Luster? For the last several years, companies who want to attract software developers have been betting big on hackathons. Set up a little coding event in a school or clubhouse – or better yet your own facility if you have something that can be used – publicize it, buy some pizza and sodas as motivational refreshments, and just sit back and wait for the developers to stream through the doors, start coding and become so enamored with your company and products that they’ll not only thoroughly adopt your APIs or platforms but they’ll also tell all their friends to do that too. Right? The world has become totally interconnected which means that more and more companies outside of the usual realm of platform and tool companies are aware of the need to connect with developers. To connect with those developers companies are opening up APIs. Open APIs are proliferating everywhere and if you’ve got an API you’ve got a platform, and if you’ve got a platform you need developers to adopt and support that platform. We’ve seen numerous companies trying to adapt to this new reality by putting together a small team and charging them with populating their platform. For many that has meant putting on a hackathon, or maybe a whole series of them and that’s about it. As Evans Data continued to measure developer sentiment, actions and technology adoption we watched the number of hackathons that developers attend rise each year and saw our clients devoting quite a lot of resources to them. But now the tide seems to be turning. The number of developers who attended a hackathon declined significantly in 2017 according to the newly released Evans Data Developer Marketing 2018 survey report. The survey showed that 70% of developers in 2017 had gone to at least one hackathon, which is a significant 19% decrease from the 83% that went to at least one in 2016. At the same time, those who went to only a small number of hackathons increased while those attending many hackathons showed a marked decrease. And it wasn’t just vendors who were putting these on. Of those who attended hackathons, 46% said they went to one sponsored by a commercial vendor while 42% attended one sponsored by a local developer organization, and 37% went to one sponsored by a school or university. It’s not entirely a surprise. One had to wonder how long the hackathon phenomenon would go on in its current state. Hackathons have become a crutch for many developer marketing professionals who don’t really understand what to do, but while they are good for getting limited grass roots support for platforms or tools, they are also labor intensive for marketers, they involve cost, and by their very nature are extremely parochial and thus limited in reach. When one considers the amount of resources it takes to reach probably less than 100 developers it really doesn’t add up. So what’s next? Online contests deliver far more bang for the buck, but for in-person events, try meetups. Last year almost three quarters of developers went to at least one meet up. 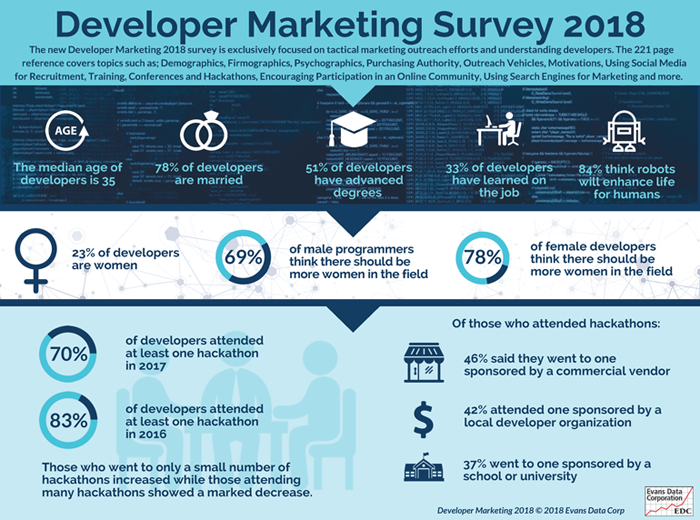 The new Developer Marketing 2018 survey is exclusively focused on tactical marketing outreach efforts and understanding developers. The 221 page reference covers topics such as: Demographics, Firmographics, Psychographics, Purchasing Authority, Outreach Vehicles, Motivations, Using Social Media for Recruitment, Training, Conferences and Hackathons, Encouraging Participation in an Online Community, Using Search Engines for Marketing and more. Margin of error is 4.2%. This past Monday and Tuesday we celebrated the 14th year of bringing top developer relations professionals, evangelists, and strategists together in a one of a kind event. The conference highlights the methods and insights of professionals in the largest software companies in the world, and allows free and easy discussion amongst peers. While some little shows have sprung up lately geared for program managers in small companies and startups, the Evans Data conference is designed for the biggest and the best. Some of our speakers and keynotes included executives from Intel, Amazon, IBM, Google, Facebook, HP, Ford Motor Company, Salesforce, General Electric and more! We also featured Guy Kawasaki, legendary trail blazer in the developer relations space. The conference was packed – sold out, and we think we’ll need a new venue next year. Plenty of great insights being shared. Throughout the two days attendees were able to benefit from stimulating conversations, workshops and sessions addressing the hottest issues in this area. One of the biggest concerns of professional at even these large companies was how do developer relations professionals prove their worth to the other departments/ management of the company. Of course some companies are more enlightened about this than others, but it’s nonetheless a concern everywhere. Another way of putting it is how do developer relations professionals demonstrate an ROI on their developer programs? Counting active users, showing an increase in frequency of developer web site visitors, attendance at hackathons or other events were discussed, but these only measure changes in reach or effectiveness. To demonstrate an ROI requires connecting the program’s activities to company revenue in some way. We talked about following a developer’s journey from awareness to evaluation to purchase or adoption and then measuring the difference between those who join a program and those who do not – a long and arduous process that may or may not show true indications. It’s far easier to show the worth of a program to the developers themselves – ask them. We’ve found that 69% of developers say they won’t adopt an API that isn’t supported by a program. Sixty percent say a program helps improve the quality of their code or provides their personal productivity. Forty percent say being in a program typically cuts their development time by 30% or more. 2017 is history and 2018 is officially underway, and that means it’s time for our annual look into the future and what the new year will bring for software development. As most of you know, Evans Data is the top resource for market intelligence on software developers. This month marks our 20th anniversary of focusing exclusively on software developers and continually surveying them to find out what technologies they’re adopting, what their issues and goals are and what they think is going to happen in the future of software. We also have tremendous insight from our clients. Each day we talk with them and we find out what they are interested in knowing and what technologies they are exploring and planning to develop. So, we’re in a pretty good position to hoist a crystal ball and foretell what the big technology news will be in 2018. Well, you don’t need to have much inside information to know that BitCoin has taken the investing world by storm. During 2017 the price of the digital currency surged more than 1,900 percent and at one point almost touched $20K. But as stock traders will point out, there’s definitely a bubble when even people who have no idea what an asset is are talking about it and trying to buy in. BitCoin is now what is called “highly frothy” and we, like most financial observers, think that 2018 will see that bubble pop. BlockChain, on the other hand, is here to stay and will continue to quietly grow as we go into the year. The basic architecture of blockchain creates a distributed ledger system which makes for secure transactions which can always be verified and traced (though in some cases with difficulty). Thus it is very useful in the financial world. But we think it will also see wide acceptance in other areas such as healthcare, energy, defense and more. While BitCoin took the spotlight, the real surge in tech adoption came from the adoption of Machine Learning and Artificial Intelligence. This was spurred by an intense interest as well as a flood of new tools and libraries such as Tensorflow, Caffe, Watson and others that help developers easily incorporate machine learning into their apps. By the end of 2017, more than 6.5M developers worldwide (29% of the world’s developer population) were integrating some machine learning techniques into their apps, while another 5.8M were planning to. While the largest group is within the APAC region, North American adoption is also hot. Expect this to grow. It’s easy enough to imagine augmented reality when it comes to games, as Pokemon Go so amply demonstrated, but that’s just a tiny fraction of what the technology can be used for. We’re predicting a lot more implementations in the healthcare field, where doctors can now “look inside” a patient, or how about the remote specialist essentially projecting his hands into the display of a surgeon on site wearing Google Glass. In manufacturing the uses are limited only by one’s imagination. For example, service technicians and manufacturers can walk up to any item that has IoT technology and immediately have access to the object’s specs, inventory, location, and lead times. In education, AR can replace outmoded and awkward learning tools. The power and versatility of AR means its use is only limited by our imaginations and we foresee lots more AR use cases in the coming year. This is the most nascent of the hot technologies for 2018, but one of the most far-reaching. Simplistically, quantum computing veers away from our established bit based, on-off electrical circuit computing by allowing for superpositioning in which a state may be on or off or a combination of both. Based on principles from quantum mechanics, this new technology is being pioneered by the likes of Google, IBM and Intel and while it may not command a lot of attention in 2018, the foundation that is created this year will be of utmost importance in the years to come.